WASHINGTON — Alaska's U.S. senators plan to give a close look to President Donald Trump's nominee to the U.S. Supreme Court, they said Monday night. Trump nominated Brett Kavanaugh, a justice on the federal appeals court for the D.C. Circuit, to fill the Supreme Court seat vacated by retiring Justice Anthony Kennedy. Alaska Sen. Lisa Murkowski has been the target of early lobbying over her future vote as a Republican who favors abortion rights. The addition of a new, Republican-nominated Supreme Court justice is expected to tip the balance of the high court to the right. Alaska Sen. Dan Sullivan is more broadly expected to support any Trump nominee, and spoke highly of Kavanaugh in a statement Monday following the announcement. "He is very well regarded as a judge on the D.C. Circuit Court of Appeals – the second most important court in the country. In that role he is known for applying the law and Constitution as written, upholding our Second Amendment rights, and having a healthy skepticism concerning the powers of federal administrative agencies," Sullivan said. Kavanaugh is known as a conservative jurist with a deep body of work. Kavanaugh went to Yale University and Yale Law School. He clerked for Kennedy, worked on investigations into President Bill Clinton and later worked for the George W. Bush presidential campaign on the Florida recount. Bush nominated Kavanaugh, then White House staff secretary, to the U.S. Court of Appeals for the District of Columbia Circuit in 2003. His confirmation was delayed until 2006 in a Senate dispute over his partisan leanings. Murkowski voted to approve Kavanaugh's nomination to the appeals court in 2006. Sullivan was elected to the U.S. Senate in 2014. "I've had the pleasure of knowing Judge Brett Kavanaugh for some time – dating back to when we worked together in the Bush administration," he said. Murkowski has not met Kavanaugh, she said in a statement released after Trump's announcement Monday night. She said she plans to sit down with him. "I intend to review Judge Kavanaugh's decisions on the bench and writings off the bench, and pay careful attention to his responses to questions posed by my colleagues on the Senate Judiciary Committee," Murkowski said. She said she would "carefully consider" a rating granted by the American Bar Association's Standing Committee on the Judiciary "and the views of Alaskans in determining whether or not to support him." "My standard for reviewing Supreme Court nominees remains rigorous and exacting," Murkowski said. "In the coming weeks, I look forward to reviewing in further depth Judge Kavanaugh's extensive record as a D.C. Circuit judge, and discussing these and other important issues with him," Sullivan said. "I expect the upcoming Senate confirmation process to be both rigorous and fair, one deserving of a Supreme Court nominee." Conservatives and Democrats in Alaska quickly squared off over the nominee after Trump made the announcement from the White House Monday night. 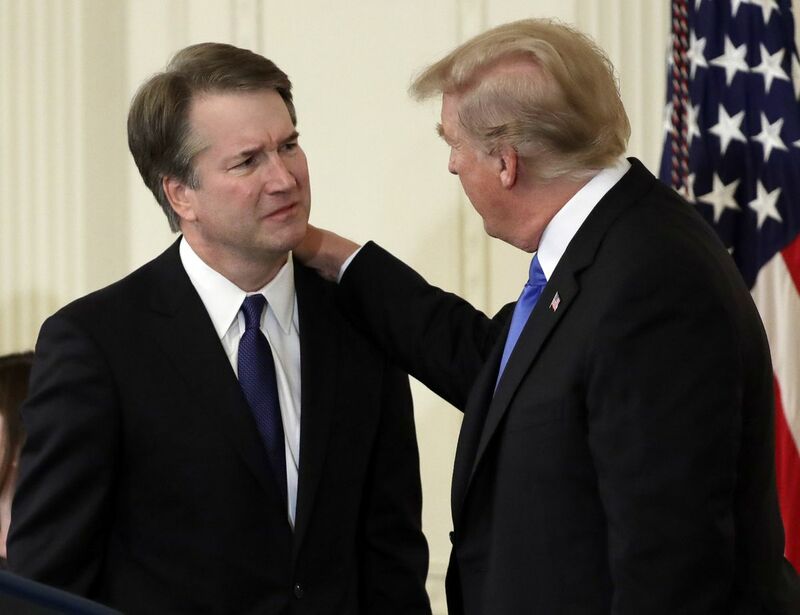 Americans for Prosperity-Alaska State Director Jeremy Price said Kavanaugh has "a sterling record of judicial restraint" and a "proven track record of defending the Constitution." The national Americans for Prosperity group is planning an activist effort to support Kavanaugh's nomination. Price said that he felt Kavanaugh met the qualifications Murkowski laid out for Justice Neil Gorsuch, a conservative Trump nominee who she voted to seat on the Supreme Court last year. "We urge Sen. Murkowski and Sen. Sullivan to do the right thing for Alaska, and the country, and vote to confirm Judge Kavanaugh," Price said. Alaska Democratic Party Chair Casey Steinau used the announcement as a chance to lobby support for former Democratic Sen. Mark Begich's bid for governor. "As we feared, Brett Kavanaugh is a nominee who is expected to support an extreme, conservative agenda on the Supreme Court putting so many of our core values at risk," Steinau wrote in an email. "As Alaskans, we have always embraced our right to privacy and believe the government should not have a role in our personal choices – including health care," Steinau said, echoing liberal concerns that a new justice will tip the balance of the court towards overturning Roe v. Wade, the landmark abortion rights case. Alaska legalized abortion in 1970, three years before the Supreme Court ruling, Steineau noted.